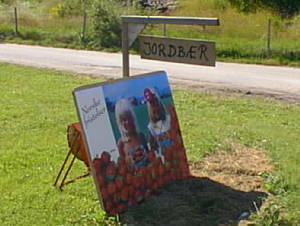 Pic of the day: The signs translates as "Strawberries" and "Norwegian temptations". We have an easy life, haven't we? I woke up today to the news that the Danish "Roskilde Festival" had suffered a tragedy. 8 visitors had died and 2 more were in critical condition, due to being trampled by over-eager fans in front of one of the scenes. They had still not decided whether or not to stop the whole music festival. The tragic episode took a goodly part of the news, despite happening in a neighboring country and involving only a few people. I'm sure that was bad enough for those involved, not to mention their relatives. Even so - it is the train wreck value, isn't it? I'm sure there die as many in our own country during the night from other avoidable causes. Smoking. Fat. Alcohol and drug abuse. Stress. Clinical depression. The occasional AIDS patient. But they have the good grace to curl up and die individually, so it's not a news topic. And good thing too. If the morning news should always start by listing the smokers that died during the night, people would be so stressed that they would need an extra cigarette to calm the nerves. It's a few days ago now that I would tighten my belt and found that it was already at its innermost notch. Not a big deal, I have other belts that go further. And I have still a visible paunch, at least when I relax my stomach muscles, and I do that a lot. (Insert mandatory joke about "battle of the bulge" here.) On the other side, literally: I put on my old yellow jogging suit today, and noticed how loose it was on my hips and thighs. Only a couple years ago, I filled it out noticably more. Seems I am shrinking. I would have felt a lot more happy about that if it were voluntary. Still, I should take what I get. It must be months now since I thought that I ought to see a doctor about the growths on my back, particularly the black one. I know enought about my family that I really shouldn't ignore such a risk: We get melanoma as easily as black Americans get hypertension. But there is no connection between risk and fear. And it is fear, not risk, that moves people to see a doctor. People, at least in this regard, includes me. So, is there anything we can do, or must we ride the way the horse runs? Fortunately, there are things we can do to align our fears and risks better. First, and obviously, we can talk about it. For instance, when people want to stop smoking, they should not just decide to. All other things being equal (yeah, right) those who build accept among their friends will have an easier time. When their friends don't expect them to smoke, and don't expect them to continue smoking if they fail at first. Shared reality. It may not feel like a bad thing to smoke (indeed, I have on good authority that it feels pretty bad to not smoke once you have become dependent). But by gradually pushing, we can align our fears with our risks, and our hopes with our efforts. Finally, we can exercise our free will. Exercise as in "work out". Stretch it a little bit longer. Skip the last piece of cake, perhaps, and take a piece of rye bread instead. Cut the goodnight drink on Sunday and rather take a slow stretch-out and some soft music to relax. You get the drift by now, I'm sure. Align our fears with our risks. Align our hopes with our efforts.